McGraw Powersports is a company that loves motorcycles as much as you do, which is why we offer protection you can trust. From the handlebars to the brakes, we’ll protect your precious cargo and its parts — for wheel! McGraw Powersports offers an extended service contract (ESC) on motorcycles that includes coverage of the engine, transmission, primary drive system, radiators, seals and gaskets, front suspension, rear suspension, brakes, cables and attachments. Electrical, fuel injection and steering components are also covered by this supplemental purchase, providing riders with more than just the manufacturer’s basic coverage. Contracts also include rental car and towing coverage options. New or used motorcycles and off-road vehicles are eligible, as well as street-legal scooters. McGraw Powersports also offers a new electric vehicle (EV) extended service contract to take care of those who care about the air and have purchased energy-efficient vehicles. Ride with ease knowing this coverage is tailored to keep bikes on the road and out of the shop in the event a covered component fails. While many appreciate a good aftermarket upgrade, it’s important to note that certain retrofitted items may be excluded under the contract — such as a turbocharger or anything that impacts speed and safety. Ask your service contract provider about exclusions and aftermarket coverage so you can stay protected. Safety should always be the top priority, and certain upgrades can prove to be downright dangerous. At the end of the day, a motorcycle is only as good as its rider. When it comes to apparel and accessories, some come in clutch and some will leave you stalled. For McGraw Powersports Regional Sales Managers and cycle savants Smitty Rensel, Jason Duncan and Shane Ballard, a few products check all the boxes. Rensel is a fan of Bell Helmets, Alpinestar boots and Shift riding gear. Duncan seconds this, saying the Bell Carbon Star Helmet is his go-to piece of gear. Ballard, on the other hand, prefers a Fox V2 Helmet and Leatt neck brace. 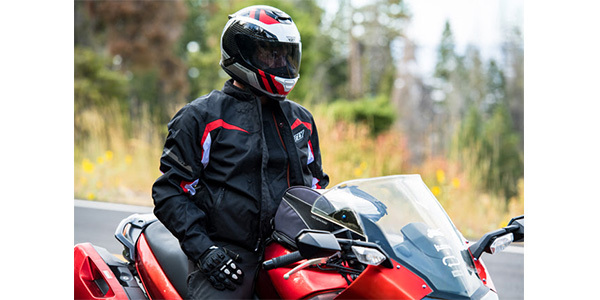 All of these accessories and apparel items maintain a sleek look without compromising on safety — a fundamental feature for any piece of equipment. For more information on motorcycle service contracts and coverage, please contact McGraw Powersports at 1-800-6-MCGRAW.